You won’t find a lot of chemicals or unproven herbs in our cream! 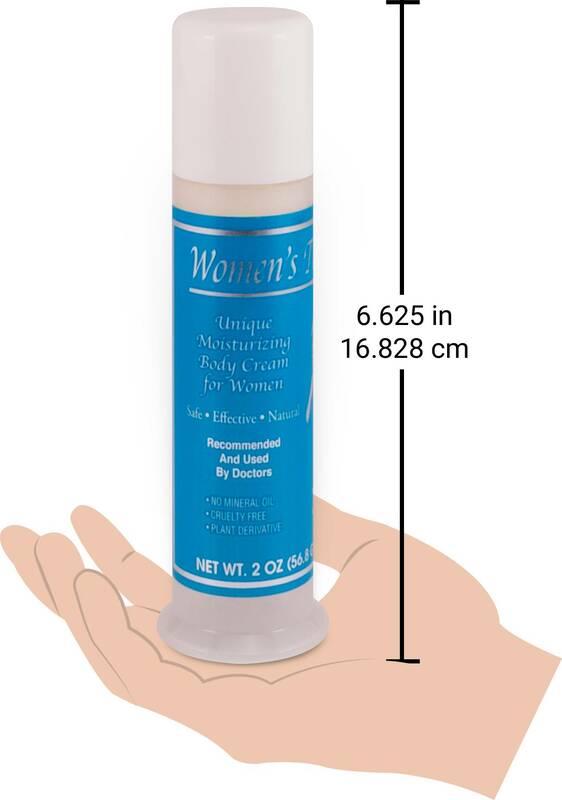 Woman’s Touch Natural Progesterone Cream provides concentrated natural progesterone USP dissolved in a moisturizing cream base containing Aloe Vera oil. Women’s Touch also tests their cream regularly with an independent laboratory which allows them to maintain quality and concentrations in the very top ranges. Each two-ounce container lasts approximately two months. Natural Progesterone Cream may be a convenient way to help with premenstrual syndrome (PMS), menopause, and osteoporosis imbalances. Many people have only a basic understanding of what hormones are and how they affect their bodies. Some medical research shows that many of the afflictions that women take in stride as being “normal for women” may actually be the result of hormone imbalances that can be easily and safely corrected. Most people know about estrogen and testosterone (the female and male hormones), but what most people don’t know about is progesterone. Progesterone is a crucially important hormone produced by the adrenal gland that acts as a “regulator” for the other hormones in our body — kind of like a thermostat that keeps your body’s various hormone levels perfectly adjusted. Most of the symptoms that women face during PMS or menopause are the result of either too much estrogen or not enough, and this is controlled by their progesterone. Sadly, in the case of estrogen imbalance, treatments sometimes only address the symptoms rather than the ailment (i.e. Prozac for PMS depression, estrogen for menopausal symptoms and osteoporosis). In some cases, there is a progesterone deficiency that is leading to their imbalance in estrogen. Without the regulating effects of progesterone, estrogen levels can get out of control. Sometimes people try to artificially adjust estrogen levels with pills instead of trying to correct the progesterone deficiency. Please note: Restored Balance’s (which is out of business) product “Premenstrual Menopausal Solutions” has the same formula, ingredients, and manufacturer as “Women’s Touch.” They are identical products! Serving Size: 1/4 Teaspoon once daily. Up to a 2 month supply per container. Suggested Use: Apply to skin. Massage well into skin. Use A.M. and P.M. Tips: When applying the Women’s Touch Progesterone Cream remember to ROTATE the application area to the body. Many people apply to their face at night after washing. Many people apply to the following areas; neck, breast, stomach, legs, arms, hands, feet, face. Applying to various parts of the body allows the Progesterone Cream to have new receptors to work with, and is most effective in this manner. In 1936, Japanese scientists discovered that a species of Wild Yam (Dioscorea villosa -mexicana) growing in the south of Mexico contained a sterol called diosgenin which is remarkably similar to progesterone. Wild yam contains a “bank” of important precursors which are believed to be able to be used by the human body to biochemically synthesize DHEA, progesterone, and other hormones nearly identical to that produced by the adrenal gland. In 1943, Professor Russell Marker discovered how to synthesize diosgenin from the Wild Yam into progesterone. For a number of years following this discovery, Wild Mexican Yam was a primary source for the production of progesterone and other hormones. Until recently, wild yam (not to be confused with the sweet potato yam) was the sole source of the diosgenin used in making contraceptive pills. According to herbalist Rosemary Gladstar in her book, Herbal Healing For Women (Simon& Schuster, 1993), wild yam is the most widely used herb in the world today, with over 200 million prescriptions sold each year that contain its derivatives. Surprisingly, there is a big difference between synthetic and natural progesterone. Natural progesterone is not the same as synthetic forms called, “progestins,” “progestagens,” or chemically altered progesterone. Natural progesterone is made from plants, not chemicals or drugs. Natural Progesterone Cream may be a convenient way to help with premenstrual syndrome (PMS), menopause, and osteoporosis imbalances. Perhaps the most devastating side effect of menopause is loss of bone density. Osteoporosis is a major public health threat for 44 million Americans (68 percent are women). In the United States today, 10 million individuals already have osteoporosis, and 34 million more have low bone mass, placing them at increased risk for this disease. More than two million American men suffer from osteoporosis, and millions more are at risk. Each year, 80,000 men have a hip fracture, and one-third of these men die within a year. A women’s hormone levels change daily during her menstrual cycle. In the first half of her cycle, prior to ovulation, estrogen dominates while progesterone is low. After ovulation, however, estrogen levels drop and progesterone rises. If no pregnancy ensues, levels of both hormones drop, and menses begin. Menopause is a biological event, signaling the termination of fertility. Severe symptoms may be due to hormonal shifts, ovarian decline, and diminished estrogen levels. Common symptoms of menopause are hot flashes, insomnia, fatigue, irritability, anxiety, weight gain, sexual changes, depression, mood swings and others. Natural Progesterone Cream is a support supplement which contains the plant extract of the Wild Mexican Yam. This cream formula allows the powerful active ingredients to be optimally used by the body because they flow through the skin. There is no way to overdose with this cream. Since the body uses only what it needs to restore hormonal balance, the cream can be used by women of all ages. Ingredients: Purified Water, Natural Glycerine, Stearic Acid, Vegetable Source, d-Alpha Tocopherol Natural Vitamin E, Avocado Oil, Natural Progesterone 1800mg usp, micronized Aloe Vera Oil, Rosemary extract, Vitamin A Palmitate, Carrot Oil, Lemon Grass Oil.